A rocket aboard a Russian submarine will hurl the solar sail craft high above Earth. 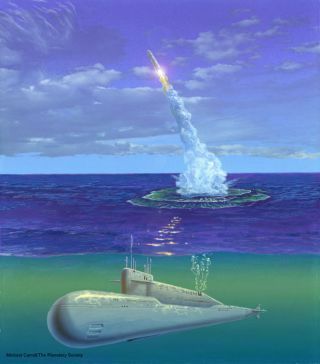 MOSCOW(Interfax) -- A strategic nuclear-powered submarine in service with theNorthern Fleet (Project 667, Delta IV under NATO classification) has gone tosea and taken position to launch the Volna carrier rocket with a solar sail. "Thesubmarine has taken a position specified in the Barents Sea," a source inthe Russian Navy General Staff told Interfax. Accordingto him, the rocket is to be launched on Wednesday night (3:46 p.m. June 21 EDT). Atthe same time he did not rule out the feasibility of postponing the launch inlight of the failed launch of the Molniya-Mcarrier rocket, carrying a military satellite, from the Plesetsk Space Center. VyacheslavDavidenko, press-secretary of the Russian Federal Space Agency, told Interfax-MilitaryNews Agency earlier that the launch of the solar sail was to take place at11.46 p.m. Moscow time (1946 GMT) on Tuesday. "Thespace launch will allow technologies to be tested. For instance, the spacecraftfitted with a solar sail will be able to move in space by capitalizing on thesunlight pressure," Davidenko said. Thesolar sail is a special structure, coated with a light-reflecting compound andconsisting of eight leafs with an overall area of 600 sq. m, which sustain thesunlight. On hitting the surface of the solar sail and being reflected, sunrays transmit their energy to the spacecraft. The sunlight pressure is extremelylow, but given its constant effect, the spacecraft can reach high speed.